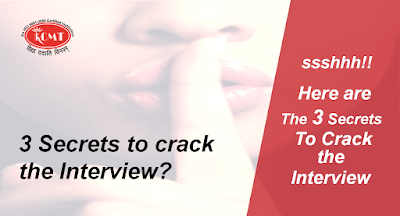 We appreciate your curiosity about knowing 3 secrets which can help you crack the job interview and yes undoubtedly you are at the right place to get your answers. 1) Be Confident – Well one of the key elements that helps you cracking an interview is being confident but the notable thing is; you can only feel confident once you have proper knowledge about the potential employer, about your skill set and profile requirements. 2) Prepare yourself – Preparation is very important before going for an interview. Preparing more always increase your chances of getting selected. Prepare yourself with frequently asked questions (FAQs), prepare yourself with cross questions (may put up) related to your Resume OR CV and Most importantly prepare your documents and your attire (formals). 3) Don’t overestimate yourself – One of the most important things is – you should not overestimate yourself before your employer. You should be more focused towards proving your worth or convincing your employer about your value rather than building castle in the air. There is a common saying – first impression is the last impression and we bet if you’ll keep these above given secrets in mind you’ll not only create a good impression but will also get selected.